The minute I heard a new cookbook was out with a recipe for Sweet Tea Pie, I *had* to have it. As soon as my copy of "Screen Doors and Sweet Tea" by Martha Hall Foose arrived, I went right out and bought the ingredients to make the pie. But here's the thing about me and pies: we don't get along well. Sweet Tea Pie, however, I would conquer. The recipe for this crust contained just three ingredients. How could I botch that? Alas, the recipe contained a pretty significant error and listed twice the amount of crust ingredients needed for a single pie. Now if I were a more experienced (and less insecure) pie baker, I would have realized this when the piecrust alone filled up nearly 3/4 of the glass pie pan, and the thing weighed 27 pounds when I put the crust in the fridge to cool as I prepared the filling. I cooked it, and cooked it some more. Then when the filling finally set, I refrigerated it, and refrigerated it some more. It was a soupy, disappointing mess. 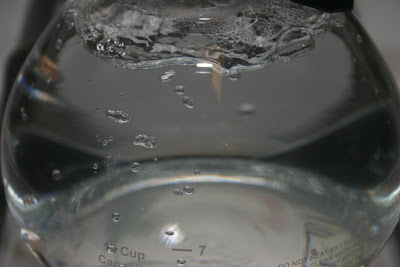 Another potential blog post down the drain! Suspecting the crust was the problem, I googled an old newspaper article about the author, which included the recipe, and discovered that the crust recipe in the book was accidentally doubled. Well, these things happen. When I was a newspaper lifestyle editor, I once typed in a recipe for the weekly food page and listed one of the ingredients as 1/4 CUP of nutmeg instead of 1/4 TEASPOON of nutmeg. Oops. 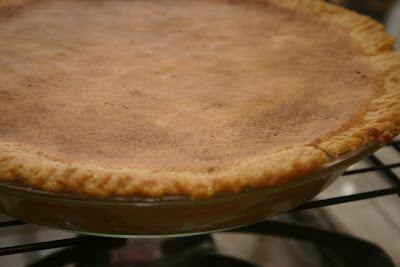 So, over the weekend I tried Sweet Tea Pie again, halving the crust ingredients. Perfection! 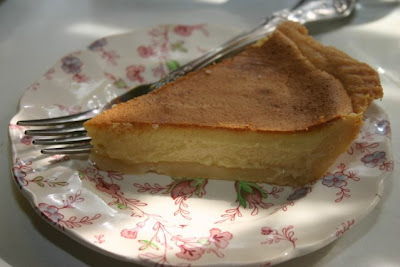 And this custard-like pie really does taste like sweet tea! Hallelujah! And you know what? Despite the error in the recipe, I really, really like this cookbook and the author. (Besides, an editor or proofreader should have caught that error.) A lot of southern cookbook authors, in my opinion, are trying too hard to impress their culinary peers and want to elevate something like, say, grits by adulterating it with overly-fancy ingredients. 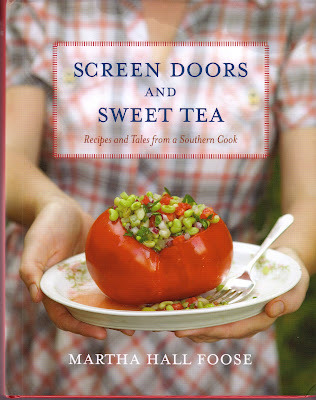 Martha Hall Foose clearly respects southerners and southern food, and I like that. She is also opposed to store-bought pimiento cheese, as am I, and we could be friends on that basis alone. (I made her pimiento cheese recipe and it turned out beautifully.) I'm also eager to try her gumbo and teacake and salmon croquette recipes. She introduces her recipes with stories and a lot of sass, and I like that. 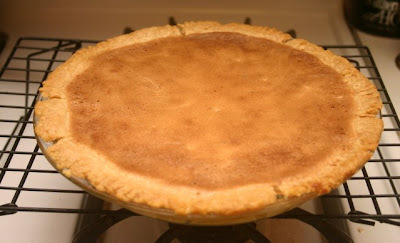 So here's the recipe for Sweet Tea Pie as I made it. Enjoy! To make crust: Using an electric mixer, beat cream cheese and butter until combined. Add flour, mix until dough forms a ball. Pat dough into 9-inch pie pan. Chill in refrigerator (the crust, that is) while you prepare the filling. 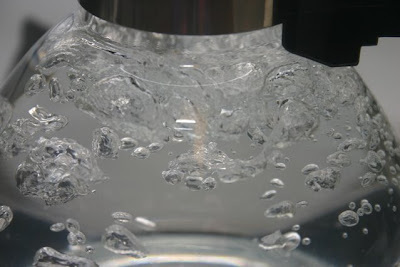 To prepare filling: Using an electric mixer, beat butter and sugar on medium til light. Add yolks one at a time, beating on low after each addition. Slowly add the tea, zest and lemon juice. Scrape down bowl. Add flour, cornmeal, salt and mix well. Pour into crust and bake for 45 minutes or until set. (I had to add 10 minutes until mine was set.) Cool completely on a wire rack, and then chill for 2 hours in refrigerator. Yields one 9-inch pie. I'd love to hear how yours turns out! For the past month or so I've been scavenging for cheap costume jewelry. Antique malls, thrift stores, eBay and Etsy.com have all proven to be good sources for the search, and though I haven't bought a lot (yet), I'm sure having fun looking! 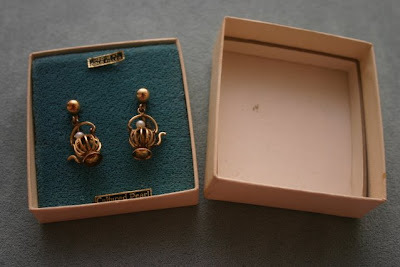 Once, I even got the original box with a set of earrings I bought, this one from Wm. 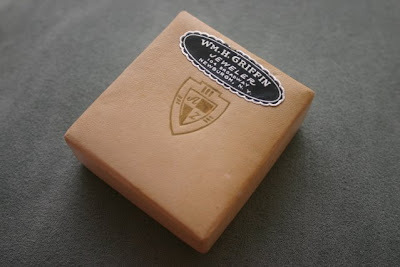 H. Griffin Jeweler, 104 Broadway, Newburgh, N.Y. 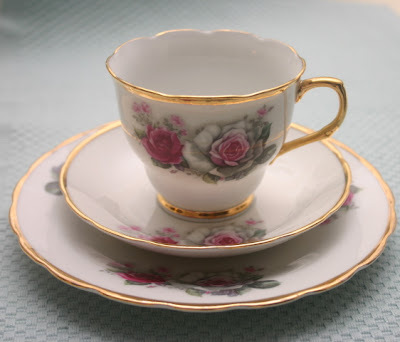 Sometimes I marvel at the sheer number of items which have featured a teapot or teacup as a design motif, from paintings to linens to costume jewelry and more. 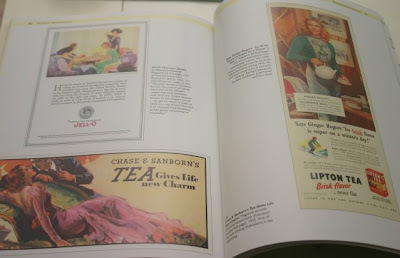 (Frivolitea has even found a "tea and design" book I need to get my hands on.) Obviously, our affection for tea has been around a long time. These Wm. H. Griffin earrings weren't made in the nineties, y'know? 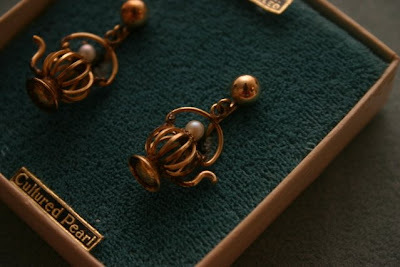 And while I'm not quite ready to sit for Vermeer, today I'm happy I get to be "the girl with the pearl teapot earrings." Time to play (teabag?) tag! "The rules of the game: Each player answers the questions themselves. At the end of the post the player tags 4 people and posts their names, and goes to their blogs and leaves them a comment letting them know that they've been tagged asking them to read your blog. Let the person who tagged you know when you've posted your answers." 10 years ago ~ I was working as the lifestyle editor of The Times-Herald, a daily newspaper in Newnan, Ga. Even then, I enjoyed *almost* everything about my job. But I have to admit that when we bought this magazine and I got to be the editor, I was delighted that I would never, ever have to work with an overbearing mother of the bride on her daughter's wedding announcement ever again. 5 things on my list today ~ 1) Write cutlines for "Web Extra" photos going up on our website when our new print magazine hits the streets tomorrow. 2) Search for new tea book I left at the office. 3) Meet with one of our freelance writers to finalize story ideas for the September/October issue. 4) Call the friend whose phone call I forgot to return until it was too late last night. 5) Tonight, remember to check the eBay bid on that gorgeous vintage rhinestone bracelet I've been watching for the past week. Snacks I enjoy ~ M&M's, occasionally Fritos and French Onion Dip, any Cucumber Cream and/or chocolate truffles left over from a tea party, and lately I'm into the new herb-flavored whole-wheat crackers. Things I would do if I were a millionaire ~ Build that house in the country my husband and I want with a huge, well-stocked pond and individually-outfitted writing cottages for both of us. (His would be more masculine, mine would double as a tea house for friends.) I would also hire the brightest and best writers, photographers and designers I could find and launch a new, nationally-distributed women's magazine for thoughtful women of all ages with an appreciation for history, the arts, literature, homemaking, gardening and beauty in all its forms. Places I have lived ~ Austell, Ga.; Buchanan, Ga.; Carrollton, Ga.; Newnan, Ga.
A friend sent me a card the other day, and inside was tucked a most wonderful treat: an ad for A&P Teas from a 1958 issue of Woman's Day magazine! Although I remember going to the local A&P store as a child, I haven't seen one of these in years but have read there are still some up north. 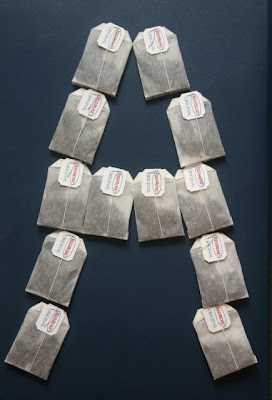 It was only as a result of my tea studies that I learned A&P began as the Atlantic & Pacific Tea Company. Mrs. A. von Dedenroth of Walled Lake, Mich. is the lady providing this testimonial type ad, promoting the fact that she saved 34 cents on A&P's teas over another well-known brand. So even 50 years ago, they liked to advertise products that save you money. I also think it's interesting that the front of the packages of tea in this ad are very specific about what's in these blends of "OUR OWN tea bags" and "NECTAR tea bags." They contain "pekoe and orange peckoe and cut black tea." And of course the ad ends reminding everyone that "A&P teas prove fine tea needn't be expensive." I'm thankful that fine tea is still a good value today! 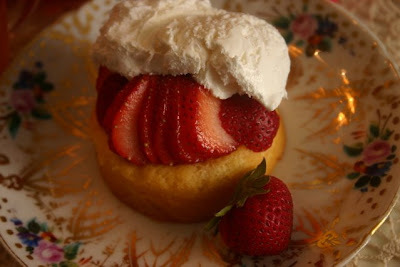 "Strawberry Shortcake, Huckleberry Pie! V-I-C-T-O-R-Y!" Anybody remember that old cheer? The flavor of these summer fruits is just so yummy, and since I don't grow strawberries I yielded to their siren call at the grocery store. The packages of shortcakes were just sitting there staring us shoppers in the face as we walked in, and although you all surely know I Much Prefer To Make It Myself, this is one of those times where I just wanted to eat it, not make it. So, I am thankful for the small mercies of ready-made shortcakes and low-fat (if frozen and not quite pretty enough for company) whipped cream. But did I get my fill of strawberries? Oh, no. 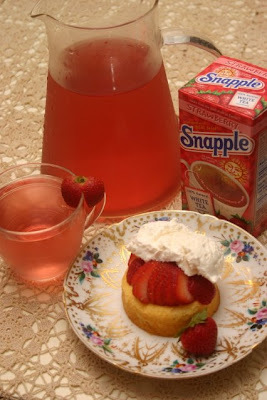 In fact, I was delighted to see this Snapple Strawberry White Tea at the grocery store because it's another, even easier way to enjoy the taste of strawberries. I'm still into "refrigerator brewing" my tea this summer, so I made a small pitcher full to keep on hand. I also tried it hot, and it is delicious that way as well. Strawberries and cream, anyone? With the Summer Olympics set to begin in China in just a few more weeks, I have my hopes up that some, if not all, of the tea in China will be featured in the TV coverage. You know how the Today Show and others tend to provide lots of "cultural coverage" during the Olympics? Well, I'm counting on them having some segments on China's tea tradition, and looking toward that I have pulled out my trusty guywan. 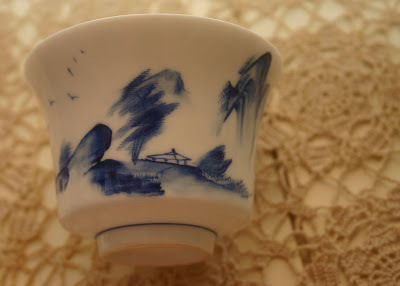 I first discovered the guywan (sometimes spelled "gaiwan") at The Tea Room in Savannah years ago. 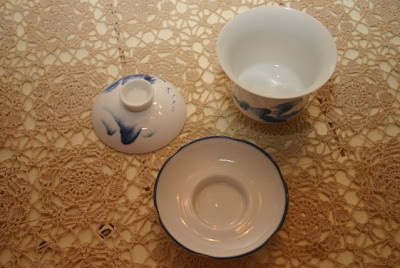 A guywan is simply a Chinese covered cup with a saucer. The set is designed to be held together while you use it, which let me tell you, takes some doin'! 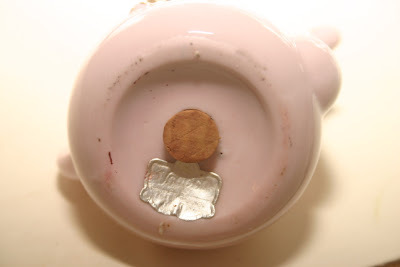 Basically, you sort of pinch the lid and saucer in your hand (thumb on top) and - with the lid tilted ever so slightly - use it as a strainer to hold back the tea leaves as you sip. Helpful hint: You might try wearing old clothes (and letting your tea cool a bit) when you first experiment with a guywan! These come in all kinds of designs, but I wanted something that looked Chinese. I've since discovered there are also clear glass guywans, and I think it would be helpful to have one of these because then you could *see* the tea as you are about to spill, I mean "sip," it. 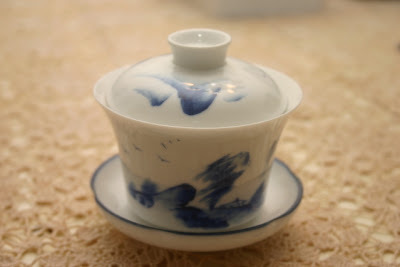 Google "guywan" or "gaiwan" and you'll find lots of information about these classic teawares. 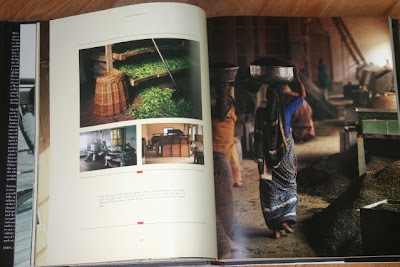 Tea table book: "The Book of Tea"
Now here's a book that has been on my Wish List for a longggg time. I started to say it was a high-end "coffee table book," but that just wouldn't be right, would it? So we'll just say it's a nice "tea table book." At any rate, "The Book of Tea" from Flammarion was $60 when I first came across a copy at a bookstore some years ago, and I just knew I'd find it on sale one day. And I did. A few weeks ago, I was looking for tea books on eBay and came across this one for 99 cents. It's quite a large book (9-3/4 x 12-1/2 inches), and I am so enjoying reading through it and looking at all the amazing photography. 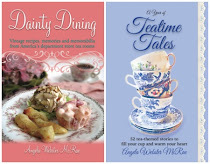 Chapters in the book are titled Tea Gardens, Tea Barons, Time for Tea and The Taste of Tea. 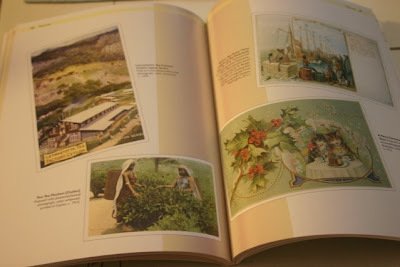 This spread is from the chapter on tea gardens. The photo at right shows the inside of a factory in India. There are lots of photos showing the growing, plucking and production of tea. I've seen such photos before, but rarely are they as beautiful as they are presented here. 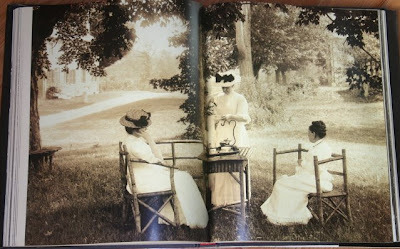 I really like the book's historic photos, including this one of ladies at tea time in New England circa 1900. There are also lots of images of tea-themed art through the ages, and it is so lovely to have this much "tea beauty" in one volume. If you're looking for a copy, Alain Stella wrote the first chapter but often seems to be listed as the author of this book. Anthony Burgess wrote the preface, so you might try searching with his name as well. This is definitely one of my favorite tea books of the year! Often, I am writing this blog post during my morning viewing of The Today Show. 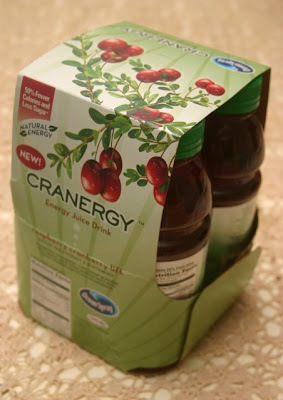 Yesterday during the show, I saw a commercial for Cranergy Energy Juice Drink and thought I heard them say it was made with green tea. Some thoughts: I like the taste. 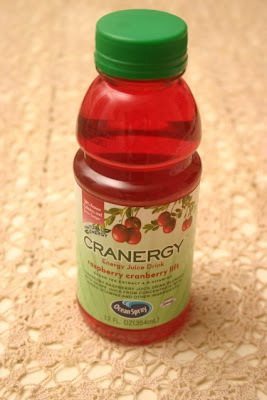 It has that tartness I like, and the 12-ounce bottle is a good size for a single serving. It has 100 percent of the RDA of Vitamin C. I read it contains 20 percent fruit juice, so what's the other 80 percent? Well, the first ingredient listed is filtered water. I'm surprised to see it contains Splenda. I drink artificial sweeteners because I know it's either that or eat the sugar bowl for me, but I realize this will be an issue for some. And I'm not sure how I feel about seeing the word "Energy" on the label, although I realize so-called "energy drinks" are hot with some consumers these days. Mostly, I was just intrigued that Ocean Spray made a commercial specifically mentioning its product made with green tea (green tea extract, actually). Would you buy it? Would you try it? Today I come to ask your help. 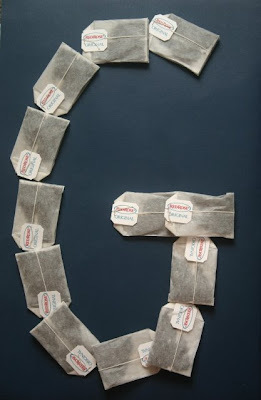 A reader who is an artist (and very attuned to the visual side of paper) tells me she recalls once seeing some tea bags with larger than usual, decorative tags. When she mentioned this it did ring the vaguest of bells with me. 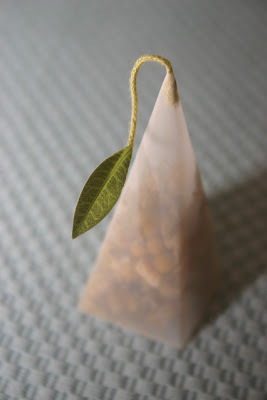 Any idea who made these teas with decorative tags? She thinks they were once featured in one of the original issues of Victoria magazine. 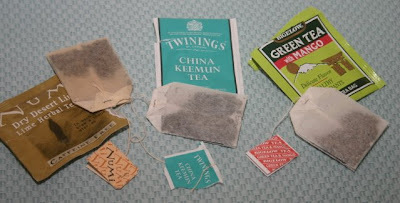 I checked out some of my current tea bag tags by ripping open packets from Numi, Twinings (the tear-off-the-packet kind of tag; I really don't like this type) and Bigelow. And yes, it's possible to tear off the old one and make your own tag to staple to the thread, but ... we want to find those pretty ones that are already out there! While not exactly "decorative," this raspberry tea a friend brought me from the Czech Republic last year does have a teacup on the tag. 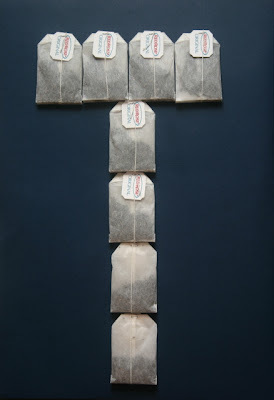 And of course the loveliest tea bag tags around right now, I say, are the Tea Forté tea bag tags, but what we're looking for are traditional flat tea bags with large, decorative tags. Can anyone help? 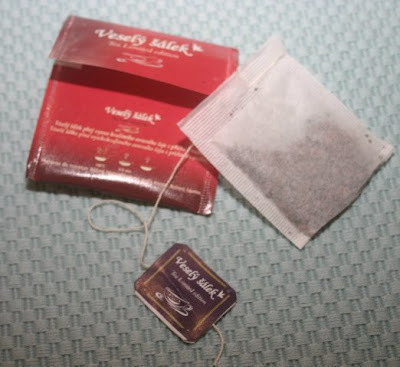 I'll be looking through those old issues of Victoria, but if you have any info on unusual tea bag tags, please share! Well, OK, I haven't really been to the spa, but thanks to a thoughtful friend I have some new "True Blue Spa" products made with tea from Bath and Body Works, and these are some of the yummiest things I've used in ages. For Heaven's Saké (heaven's saké! how funny! ), a bath and body wash, is made with Japanese saké but also with camellia sinensis leaf extract. In the shower, this oil-to-cream body wash works up to a rich lather, and the scent is just divine. Equally yummy is this Self Meditating Body Butter. 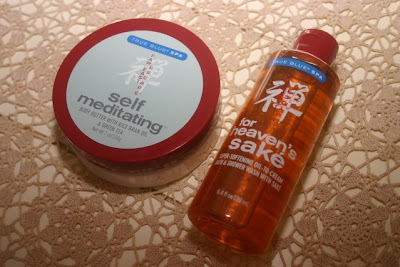 (I have to say that the editor in me wonders how a CREAM can be self meditating. Or am *I* supposed to meditate on self while I'm using it? I'm self-centered enough as it is, thank you, so I think I'll let the cream worry about the self meditating). At any rate, the body butter is made with rice bran oil and green tea. Great products, and a great gift! 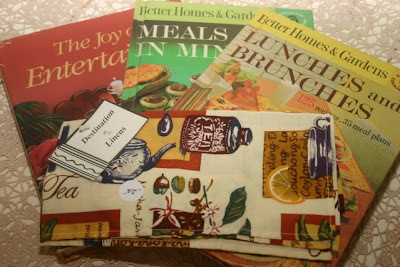 Two of the books, "Meals in Minutes" and "Lunches and Brunches," were printed in 1963, the year before I was born, and I just love seeing what food fashions were in vogue back then. One has a recipe for Spiced Iced Tea (the pre-Tang version), and this one has a recipe for Pink Parfait Pie you make in the blender. 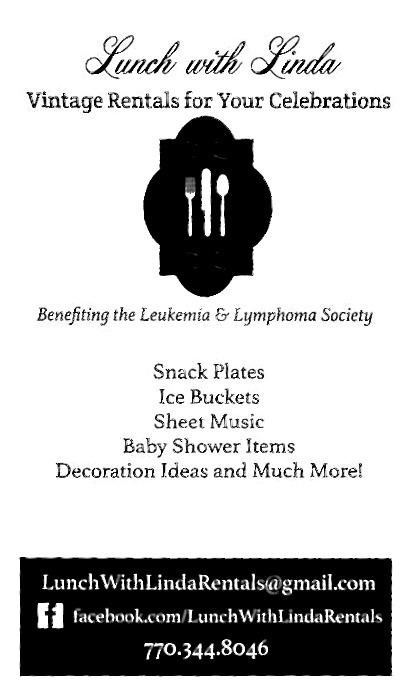 Yes, nothing says "elegant tea party" quite like having a blender on the table with the teapot! A later but still vintage volume is "The Joy of Entertaining," from 1983. 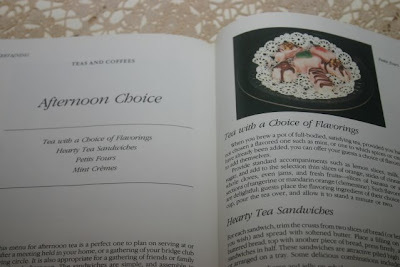 It has a chapter on teas and coffees and a recipe for Petits Fours. 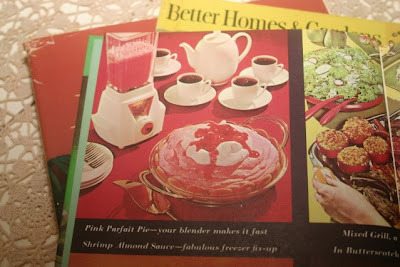 Reading these retro recipes gave me an idea, too. Wouldn't it be fun to have a "Retro Tea" and ask all your guests to wear clothes from the sixties and seventies? Perhaps a few beehive hairdos, false eyelashes and frosted pink lipstick? The hostess, of course, would have to assemble some teawares with age-appropriate motifs (those "atomic" designs, perhaps), and of course the color palette would need to include Harvest Gold and Avocado Green. So what do you say? Would you come to my Retro Tea Party? 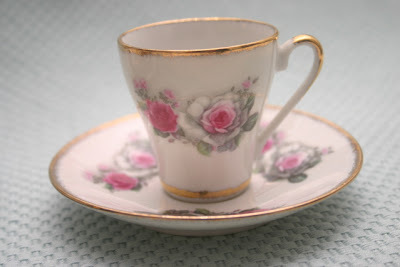 Many are the tea things I have collected over the years, but one of the few objects I have managed to refrain from collecting is the miniature teacup and saucer set. These are often very cute and easy to find, but you can't really use them, and they take up lots of valuable space that could best be used on adult-sized pieces like the full-sized trio shown here. So, I rarely buy tea miniatures. But the main reason I bought this is that it's obviously a relative of the set of six trios I received as a gift many years ago. A friend of mine's mother found these at a flea market in Arkansas and thought I would really like them, and she was right! I've actually seen a matching teapot in a tea cookbook, but never any of the other serving pieces. Maybe this miniature set is a sign of things to come! 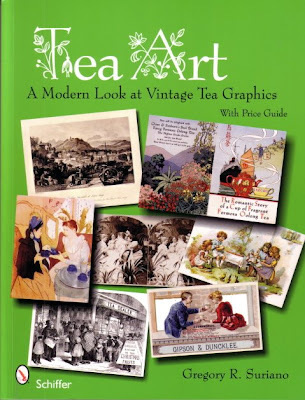 My favorite tea book is often the latest one I've received, but there's a new one out that I must highly, highly recommend to tea lovers for a place of honor in the tea library: "Tea Art: A Modern Look at Vintage Tea Graphics" by Gregory R. Suriano (Schiffer Books, $24.95). This is the first book to cover the topic of paper ephemera associated with tea, and I'm just sorry I didn't come up with such a great idea myself, because this would have been loads of fun to research! Have you ever come across a tea-themed postcard on eBay or at an antique mall? I have precisely one (an old tea room near Atlanta), but obviously I just haven't been looking hard enough or long enough. Here are just a few of the images of postcards from "Tea Art." Have you ever seen a tea advertisement in a vintage magazine? I haven't, although I sure do love the one above right with Ginger Rogers, and you can bet I'll be looking for such ads NOW. In addition to postcards and periodical advertisements, the book also covers prints, posters, book and periodical illustrations, booklets, sheet music, trade and trading cards, labels and packaging. (HINT: Even before I got this book, I started saving at least one teabag wrapper out of every box of teabags I purchase. I'm scanning them to my computer for both collecting and crafting purposes.) 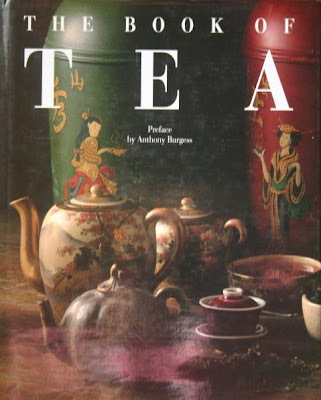 "Tea Art" also includes tea history, a nice bibliography and a price guide to these tea-themed paper collectibles, making Suriano's new book an especially delightful read for those of us who love all things tea. Years ago, I had several sets of tea-themed salt and pepper shakers, but I got tired of the counter clutter and sold them at a yard sale. Naturally, I've re-thought that decision a few times. When I came across these little guys for just a couple of dollars at an antique mall recently, I couldn't resist. 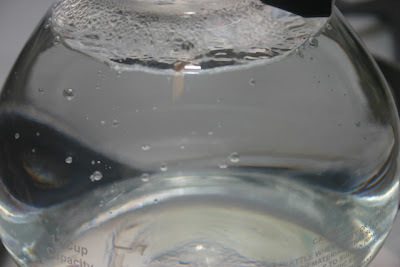 They measure about 1-3/4 inches tall and 2-1/2 inches wide. 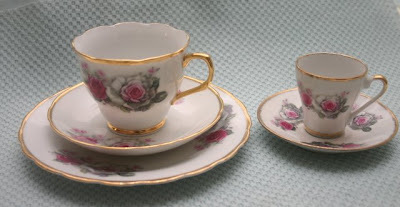 The gilded grape leaves are a little on the gaudy side, but the color is a soft, vintage shade of pink, so I have these on display in a cabinet with some other tea things. I'm always interested in tracing the history of vintage pieces, and these salt and pepper shakers both have silver foil labels but they're hard to read. I believe the very bottom says Made in Japan, but I can't quite make out the company name. Vongoo? Vongeo? Vongco? At any rate, I continue to be amazed at how many old things used tea or teawares as inspiration, including these sweet little salt and pepper shakers. Pink Lemonade "Tea to Go"
Yesterday I got the new Upton Tea catalog in the mail, and they write about how their tea sales always slump during the hot summer months and go through the roof when there's snow outside. Here in Georgia it was in the high nineties yesterday so I did not want hot tea when I got home from work, but fortunately there was some "Blue Mango" green tea from Aunt Laura's Sweet Shoppe steeping in the fridge. 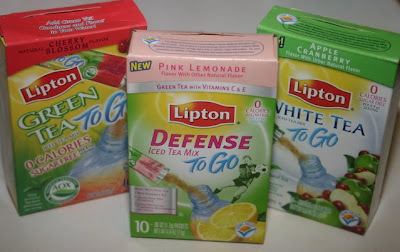 The heat is probably another reason I made an impulse purchase of Lipton's "Defense to Go" iced tea mix while buying some groceries last night. I've been drinking Lipton's "Green Tea to Go" and "White Tea to Go" tea mixes from about the time they came out, I believe. 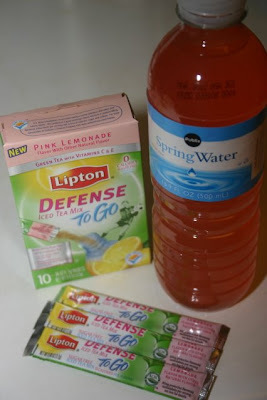 Yesterday, however, was the first time I've seen "Defense to Go" tea mix, in this case a Pink Lemonade flavored green tea with Vitamins C&E. The taste is quite tart, but when you're in a lemonade-sipping mood that's just fine. 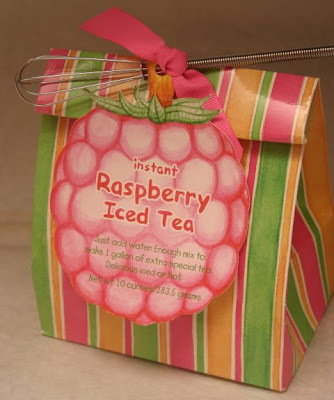 These little packets are great for popping in your purse so you can have some flavored "iced" tea with you at all times. 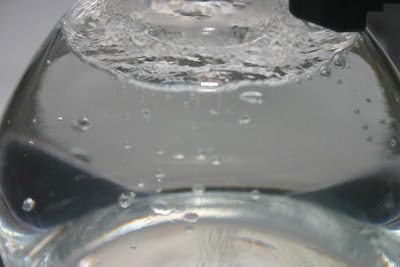 (If only they made ICE in a portable packet. Now there's an idea!) I've also enjoyed the Apple Cranberry White Tea flavor, and less so the Cherry Blossom Green Tea flavor, which really does taste like Kool-Aid to me. I think the Green Tea with Mandarin & Mango remains my favorite of these types of teas, but Pink Lemonade was new (and pink! ), and so I had to try it. 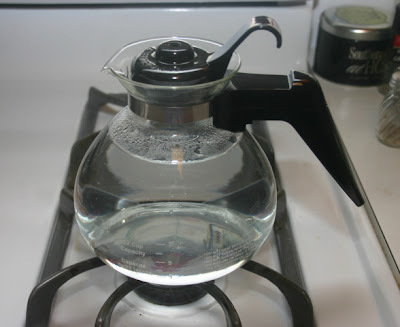 I'm still considering getting that electric tea kettle favored by so many of you, but I have to say, for observing the water stages, nothing really beats a simple glass tea kettle! 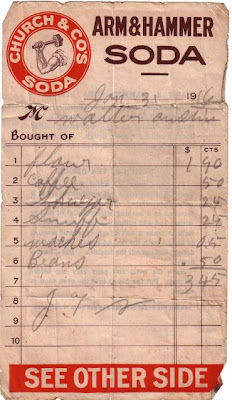 I don't know if you can read what's on the front, but Walter somebody's list from Jan. 31, 1916 called for Flour, Coffee, Shugar (sugar? ), Snuff, Maches (Matches?) and Beans, all of which totaled $3.45. I'd love to know what size jar/bag/can these items were, because I have a feeling $3.45 went a lot further in 1916 than it does today. 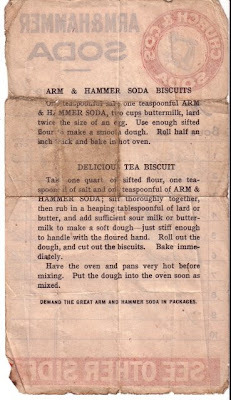 On back of the sales ticket are two recipes, and I was delighted to see the one for Delicious Tea Biscuits. In case you double click the photo and it's still too hard to read, I'll share it with you below. I haven't tried these biscuits yet, but the next time I'm in a biscuit-baking mood I'm sure I will. Take one quart of sifted flour, one teaspoon of salt and one teaspoonful of ARM & HAMMER SODA; sift thoroughly together, then rub in a heaping tablespoonful of lard or butter, and add sufficient sour milk or buttermilk to make a soft dough -- just stiff enough to handle with the floured hand. Roll out the dough, and cut out the biscuits. Bake immediately. Have the oven and pans very hot before mixing. Put the dough into the oven soon as mixed. DEMAND THE GREAT ARM AND HAMMER SODA IN PACKAGES. 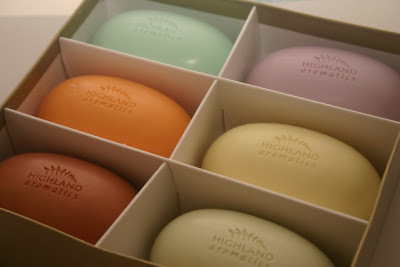 A year ago, I received this lovely box of Tea Soaps as a gift. The box is so pretty, I couldn't bring myself to tear into the package for a whole year. And I have to say, I've never even heard of Fennel Tea. Have any of you? Have you tried it? 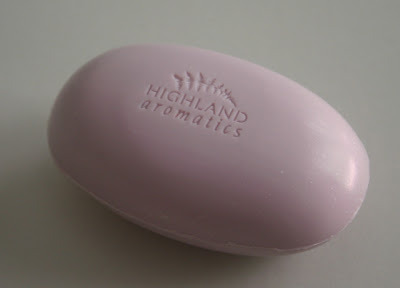 But since I was out of "good soap" this week (you know what I mean: non-grocery store soap), I decided the time had come to actually use this sweetly-scented gift. 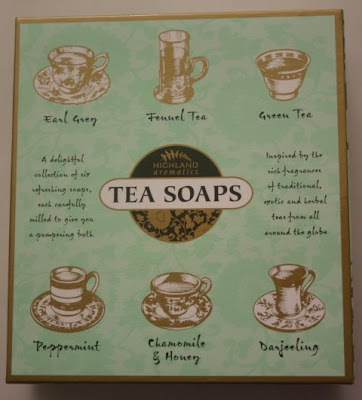 These soaps don't actually contain tea but are rather "inspired" by some classic tea scents. The soaps smell lovely, give a plush lather, and are in a gorgeous box that I plan to save and use for storing some tea-related trinkets. I started with the Earl Grey because of its pretty lavender color. Know of any other tea soaps I haven't written about yet? The very same day I found my "Shabby Chic Teapot" last month, and in the very same antique shop, I found what I think is the prettiest tea pitcher and glasses I've ever seen. 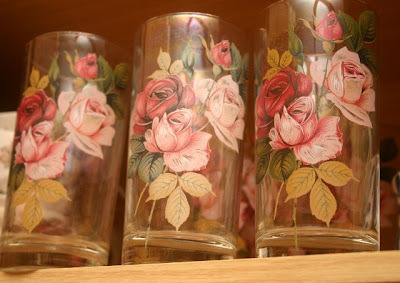 I had been on the lookout for more glasses with roses on them for when my family comes to tea, since they are more "iced tea people" than "hot tea people." But vintage beverage glasses seem to keep going up in price, and I wasn't willing to pay the prices I'd been seeing. 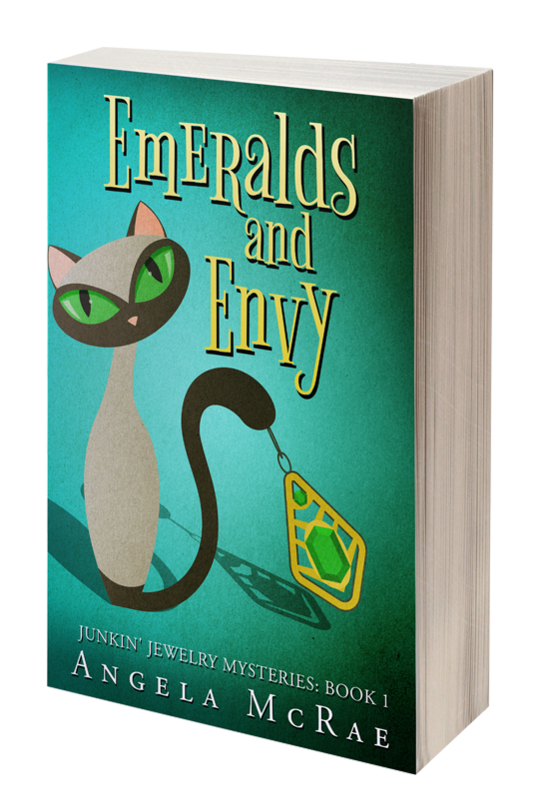 I had actually stooped down to look through a basket of costume jewelry (anyone else love costume jewelry?) when, just past the basket I was plundering through, I spotted what I thought was a rose design near the shadowy bottom row of a bookshelf. You antiquers know the feeling: "Is that a rose I'm seeing under there? Yes! Some rose glasses! Oh my goodness, it's six of them! Oh dear, I hope that doesn't mean they want $25 or $30 since there's a complete set. But what's that next to it? Oh my goodness, a matching tea pitcher!" I had never seen a tea pitcher and glasses this pretty before, and I'm sure I must have held my breath as I reached for the little hanging tag. Frankly, I was expecting it to be anywhere in the $60+ range, and I was almost disappointed at finding the lovely pitcher because I thought the set would no doubt be more than I wished to pay. Reader, it was $20 for the whole kit and kaboodle! I couldn't get to that cashier fast enough. There was even a vintage paper label inside one of the glasses revealing that these were made in West Virginia. 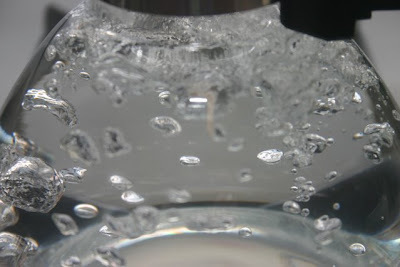 And I hope you can see this as the glasses sit in the kitchen cabinet (top photo), but they are washed in a sort of iridescent "luster" finish. Lovely AND a bargain! 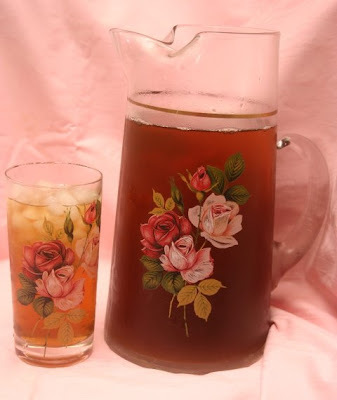 A friend recently gave me this cute package of raspberry iced tea mix, and it was as delicious as it was pretty, served up in a pitcher and glass this particular rose-loving friend would no doubt approve of. If I don't find another great bargain this year, I don't think I can complain!